I kid you not, what I am about to tell you is true. Long ago when I was a teenager, me and a couple of my buddies went drinking and had a good time. We used to love back-roading whilst we drank, for some reason it was more fun. The environment got scarier and scarier as we kept going deeper on the back dirt roads, but we didn't really care because we were all drunk. The trees along the dirt road were so enormous, that the top of my pal's car were almost scraping the branches. The branches came very low to the ground, almost like an arch. After going through the large forest with many dirt roads, we found this abyss of land, with almost freshly cut grass. It was practically a giant field, with a church in the middle. Scary enough as it is, the church looked like it was from the 1800's, and it was all boarded up as if it was condemned. It looked really eerie, and to spice it up, it was almost pitch black dark as well. We really wanted to see inside, because we had nothing else to do (like I said, we were drunk). The planks that boarded up the front church door wasn't that hard to remove either. When we went inside the church, you would never ever guess what we saw. We saw a giant Kip's Big Boy statue, and strange enough as it is, the statue was in a giant hole (almost like a crater) in the middle of the church. It's scary, because if you know what a Kip's Big Boy looks like, they are HUGE! So that just allows you to picture what the hole in the church looked like. But finding the statue isn't the scary part... we all decided to get some carriers and take the Kip's Big Boy out of the church. We were drunk, so I don't really know how we would have gotten the statue out of the church. When we came back was the horrifying part. When we walked in the church again, about an hour later, the statue was completely missing; no where to be found. And there's no possible way you could get the statue out of the church because of it's size, without breaking the walls. We drove out of the church area so fast you wouldn't believe. And remember, it was pitch black dark outside. The only light you could see was from my friend's car. 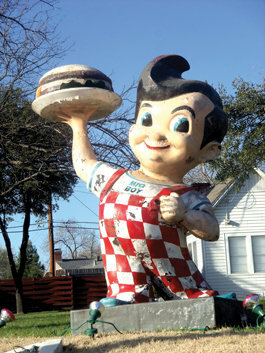 Attached is a picture of a Kip's Big Boy.